As Halloween approaches, engaged couple Mae December and Sheriff Ben Bradley have devoted all their energy to Ben’s campaign for reelection as sheriff of Rose County, Tennessee. The race is already too close to call when the sheriff’s office is hit with yet another maddeningly tricky murder case. In recent years the town of Rosedale has had more than its fair share of murders, a fact Ben’s smarmy opponent is all too eager to exploit. 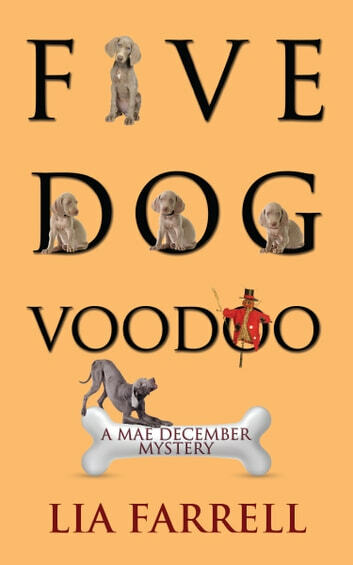 Investigator Dory Clarkson and her friend, Counselor Evangeline Bon Temps, are visiting the mysterious Voodoo village when a resident tells them her granddaughter, Zoé Canja, is missing. Her dog, a Weimaraner nursing four pups, escapes the house and finds the young woman’s body in a shallow grave. Evangeline becomes Sheriff Ben Bradley’s unofficial consultant because her grandmother in Haiti and later her mother in New Orleans practiced Voodoo. A threatening symbol is left on the pavement by Dory’s front door, effectively banning her from the case. Evangeline and the sheriff’s office ask too many questions, and Evangeline soon wears out her welcome. Voodoo curses aside, Ben’s job is at stake, and no one associated with the case is safe until the killer is found. Book 5 in the Mae December Mystery series, which began with One Dog Too Many. Billionaire Romance: Passion, Seduction and Pregnancy!